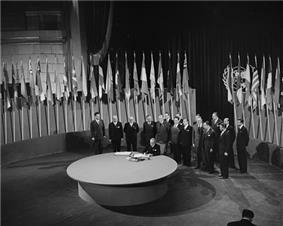 Created in 1945, the United Nations is responsible for much of the current framework of international law. 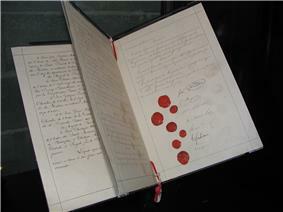 The First Geneva Convention (1864) is one of the earliest formulations of international law. International law is the set of rules generally regarded and accepted as binding in relations between states and between nations. It serves as a framework for the practice of stable and organized international relations. International law differs from state-based legal systems in that it is primarily applicable to countries rather than to private citizens. National law may become international law when treaties delegate national jurisdiction to supranational tribunals such as the European Court of Human Rights or the International Criminal Court. Treaties such as the Geneva Conventions may require national law to conform to respective parts signed and ratified. Much of international law is consent-based governance. This means that a state member of the international community is not obliged to abide by this type of international law, unless it has expressly consented to a particular course of conduct. This is an issue of state sovereignty. However, other aspects of international law are not consent-based but still are obligatory upon state and non-state actors such as customary international law and peremptory norms (jus cogens). Public international law, which governs the relationship between states and international entities. It includes these legal fields: treaty law, law of sea, international criminal law, the laws of war or international humanitarian law and international human rights law. International law has existed since the mid-19th century. However, its philosophical origins are found in 16th century thinkers such as International Monetary Fund. The development and consolidation of such conventions and agreements has proven to be of great importance in international relations. International law is sourced from international decision makers and researchers looking to verify the substantive legal rule governing a legal dispute or academic discourse. The sources of international law applied by the community of nations to find the content of international law are listed under Article 38.1 of the Statute of the International Court of Justice: Treaties, international customs, and general principles are stated as the three primary sources; and judicial decisions and scholarly writings are expressly designated as the subsidiary sources of international law. Many scholars agree that the fact that the sources are arranged sequentially in the Article 38 of the ICJ Statute suggests an implicit hierarchy of sources. However, there is no concrete evidence, in the decisions of the international courts and tribunals, to support such strict hierarchy, at least when it is about choosing international customs and treaties. In addition, unlike the Article 21 of the Rome Statute of the International Criminal Court, which clearly defines hierarchy of applicable law (or sources of international law), the language of the Article 38 do not explicitly support hierarchy of sources. Conflict of laws, often called "private international law" in civil law jurisdictions is distinguished from public international law because it governs conflicts between private persons, rather than states (or other international bodies with standing). It concerns the questions of which jurisdiction should be permitted to hear a legal dispute between private parties, and which jurisdiction's law should be applied, therefore raising issues of international law. Today corporations are increasingly capable of shifting capital and labor supply chains across borders, as well as trading with overseas corporations. This increases the number of disputes of an inter-state nature outside a unified legal framework, and raises issues of the enforceability of standard practices. Increasing numbers of businesses use commercial arbitration under the New York Convention 1958. The term "international law" refers to treaty law made in and between sovereign states. "Law" is defined as "a rule of conduct or action prescribed or formally recognized as binding or enforced by a controlling authority," whereas "sovereign" is defined as "supreme power or authority." Given this contradiction, nations have at times abrogated "International Laws" in their national interest. The term "world law" is the evolution of a system of law at the global level representing the sovereignty of the whole. Initial steps have been taken to evolve a system of supra-national laws, but true "world law" may await the evolution of a legislative body of, by, and for the people of the planet. There were ambitions to make the East African Community, consisting of Kenya, Tanzania, Uganda, Burundi and Rwanda, a political federation with its own form of binding supranational law but this effort has not been completed. ^ "international law". The Free Dictionary. The American Heritage® Dictionary of the English Language, Fourth Edition copyright ©2000 by Houghton Mifflin Company. Updated in 2009. Retrieved 13 September 2011. ^ Thomas Woods Jr. (18 September 2012). How the Catholic Church Built Western Civilization. Regnery Publishing, Incorporated, An Eagle Publishing Company. pp. 5, 141–142.